Strong winds have caused travel disruption and power cuts across parts of the country. Aileen, the first named storm this season, has now eased away but caused problems on rail routes and left thousands without power overnight. 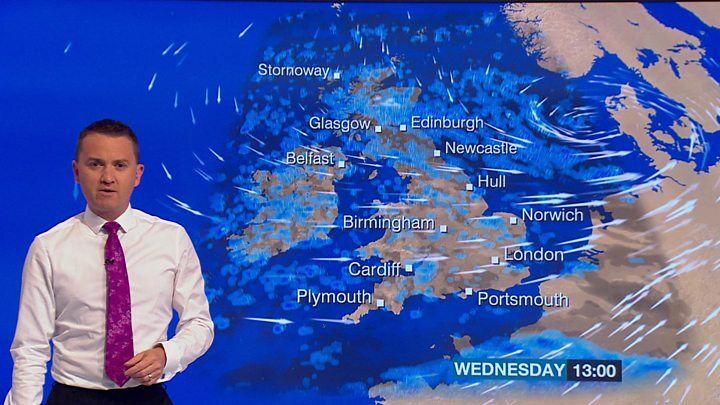 The Met Office said gusts of 74mph hit Mumbles Head in south Wales, with southern parts of northern England and the north Midlands also badly affected. Lorry drivers and motorcyclists were warned of the risk of being blown over. Throughout the morning, rail travellers faced slower journeys and cancellations, but services now seem to be returning to normal. On its website, National Rail said falling trees and large branches, power cuts and debris blown onto the tracks had caused difficulties. By lunchtime, only Southern rail and Thameslink were still reporting difficulties. Other services were also affected during the morning rush hour. At its height, the storm cut power to 60,000 homes in Wales - some for 10 minutes, others for several hours. Western Power Distribution, which provides electricity to homes in south and west Wales, said all affected areas, from Pembrokeshire to Monmouthshire, were back up and running. Northern Powergrid, which covers north-east England, Yorkshire and Lincolnshire, said 7,400 homes had lost power overnight, and it was still working to restore power to 800 customers. Electricity North West said about 1,300 homes were affected. Police forces in Staffordshire, Cheshire and Gloucestershire all reported trees being blown over by the winds during the night. The Met Office said there was no connection between high winds in the UK and the recent extreme weather in the Caribbean and the US. The UK's weather system came from the north, in the Atlantic, the Met Office added. By late morning, all weather warnings had been lifted and Storm Aileen was heading for the Netherlands. The Environment Agency lifted two flood warnings, but 7 alerts remain in place for areas where flooding "is possible". By contrast, on this day last year, the temperature in Gravesend, Kent, reached 34C (93F). Storm Aileen is the first storm to be given a name since they were announced for the 2017/18 season. Other names on the list include Dylan, Octavia, Rebecca and Simon.